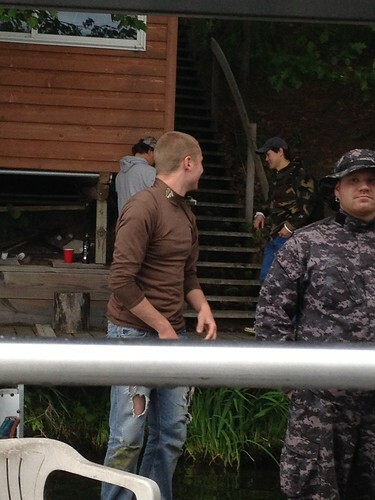 Ming and I headed out to Wisconsin yesterday to play some paintball on Ron's personal island. Last time we went, two years ago, it was raining and the turnout was about six people and I couldn't play. This time, it threatened to rain, the power even lurched at breakfast in Minnesota, but we went anyway. The day was beautiful for the most part on the island, cool and only a small amount of sprinkling. Back in Minnesota they got storms and 68 mph winds. I think about 14 people showed up, so it was even good playing. 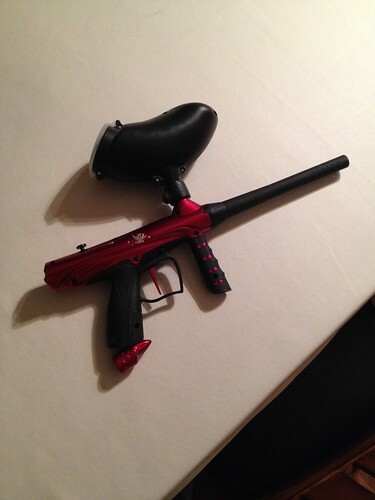 I bought a new paintball gun, so it was fun to try it out. Eryn played with it outside last night and today and had a lot of fun. It worked well except for when I ran out of CO2 and the bullets were sort of lobbing toward the target, and one of the canisters Fleet Farm filled up for me in Menomonie (the 20 oz one) broke its seal in the car and we had to pull over to make sure we wouldn't pass out. I was also shot by my own team member as I fell back once because he thought my red gun looked too much like an orange arm band. That, or he just wanted to shoot me. 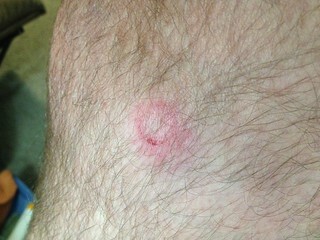 My paintball skillz are not exceptional. I managed to shoot two people, but was in turn shot by many (including my own team, as mentioned). 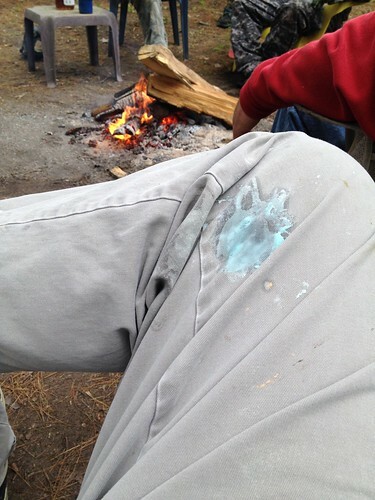 Two different times I managed to get myself into a crossfire where I was taking paintballs from two different directions. A tree is less useful cover at that point. That I took so many of my shots to the extremities attests to that. The second time it happened, there was so much paint hitting the tree and spraying all over with little pings, that I thought I'd been hit. 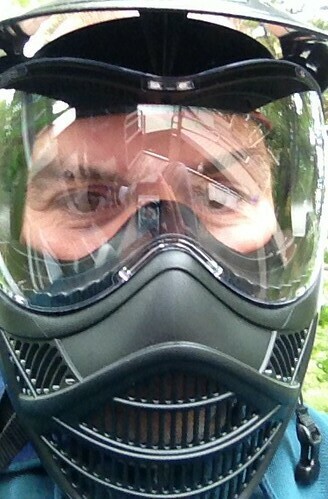 But when I reached up and brushed my mask I was surprisingly injury free. Moments later, like in Elder Scrolls, I took an arrow to the knee. It doesn't look so bad here. It looks much worse here. I had four of these. Three on my right leg. One near my left armpit that was the worst and is bruising up nicely. Here's Ming, camo-ed up. The paintballs he took to the back bruised and he was out there for a few more games than I was, so more paint was flying. Highlights of the day included some excellent grilled chicken, one of my co-workers (Jeff) losing his shoe in the swamp, and another co-worker (Stuart) wearing an ugly Christmas sweater to the event. He'd meant to give the ugly sweater to his girlfriend, but they had broken up and his new intent was to get shot a lot and then burn it. Today, Eryn, Pooteewheet, and I pursued less violent activities, but no less cuthroat. 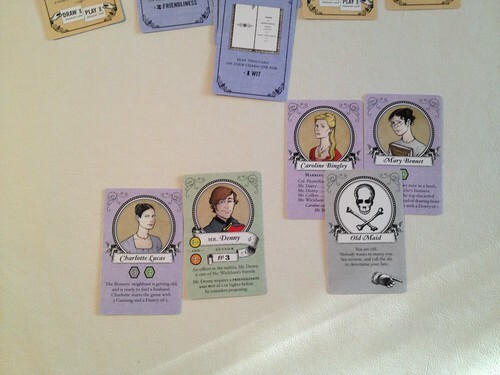 We learned how to play the basic version of Marrying Mr. Darcy, the Pride and Prejudice card game. 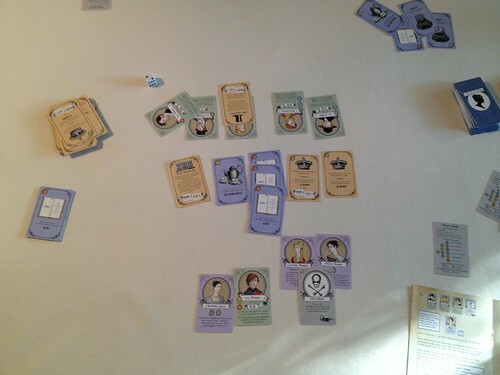 It was very fun, even if you don't know the plot to Pride and Prejudice. Each of you is one of the women from the book and your goal is to marry the optimal suitor. This entails balancing your personal traits to get them to propose. But just because you're worthy of proposing to, doesn't mean they will propose. And along the way your competitors pick away at your traits, random events cause scandal and elopement, and you store up cards to get first crack at the suitors before someone else steals the best ones. You can pin all your hopes on one suitor, as Eryn did, but he still may not propose (e.g. you roll a 1 or 2) leaving the random points of spinsterhood in your future. Eryn ended up a spinster governess. My wife ended up a spinster supported by her uncle and cheered by her cousins. I was in a good place to score a pile of points with Mr. Darcy, but only needed 10 points to win, so played my odds and took the proposal from my second best option, Mr. Denny, rather than chance being an old maid. Here are the glowering old maids (Caroline is a really bad pianoforte player, by the way, and Mary decidedly lacks wit) tut tutting during our wedding. Perhaps their fathers will support them with their dowries. Oh, that's right, Mary has no dowry. She's happy but poor. No room of her own for her. There are about half a dozen variations and an undead version we intend to try. A good choice of games to back on Kickstarter.